Make some room on your holiday movie watch list because you might just want to add this one to the rotation. This past Thursday I attended an advance screening of the new Christmas comedy, The Night Before. From watching the trailers, going in I expected the usual hilarious drug-fused comedy Seth Rogen is known to put out each year, but this film is so much than a comedy. If you have seen 50/50 with Seth Rogen and Jason Gordon-Levitt, The Night Before has that similar tone. Its comedy meets serious real-life problems. 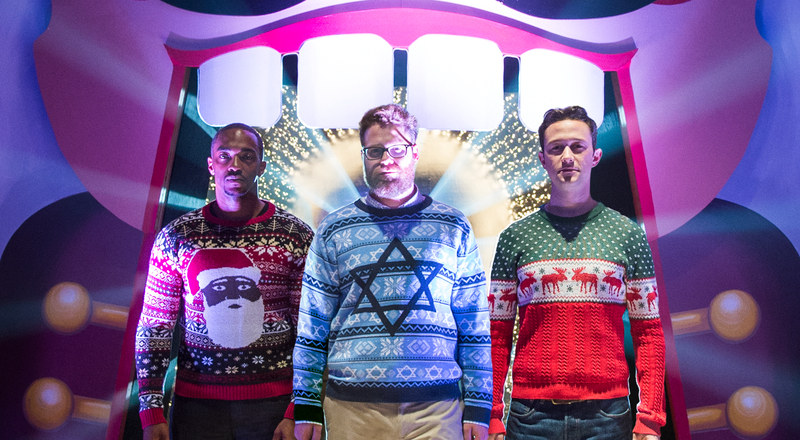 Directed by Johnathan Levine (Neighbors) and produced by Seth Rogen, The Night Before follows three friends who have decided that this year would be the last year they celebrate their annual night of Christmas celebration and of course, debauchery. The trio began their Christmas tradition, when Ethan (Joseph Gordon-Levitt) lost his parents on Christmas Eve a decade ago. Both Isaac (Seth Rogen) and Chris (Anthony Mackie) have a lot happening in their lives at the moment (Isaac is preparing to become a father and Chris having a successful football career), and are also placed with the dilemma on how to break it to Ethan that they cannot continue this tradition after their last night, no matter what. On the other hand, Ethan is down on his luck after a bad breakup, but everything changes when Ethan “finds” 3 tickets to an exclusive party. Not all is what it seems. Isaac is actually terrified of the thought of having a child and Chris successful football career didn’t come “natural”. Throughout the film, all of these problems and situations are brought to the light through the traditional “Christmas past, present, and future”, but in a wild hilarious manner. The scenes that include the main three characters talking with local weed dealer, Mr. Green were very amusing. What would a Seth Rogan produced film be without a great deal of drug use? As seen in the trailer, Isaac’s wife, Betsy (played by Jillian Bell), decides to let Isaac have one more great night with his friends by giving him an assortment of narcotics – a recipe for chaos. The director did a great job of giving the audience a glimpse of what Isaac is feeling and seeing at certain points when intoxicated. One scene that that stood out from the rest as being over the top funny was when Isaac received a “risqué” text message on his “phone”. I found myself laughing uncontrollably during this scene. I wasn’t alone either; the entire theater felt the same way. I’m positive that this scene will be one that all will be talking about for quite a while. There are some great cameos that actually play well into the plot of the film. A Night Before was very enjoyable. There was great chemistry between Anthony Mackie, Joseph Gordon-Levitt and Seth Rogen. Over the top comedy, real life situations, and Christmas makes this film a must see during the holiday season. Definitely go out and see The Night Before when it opens in Theaters on November 20th.